Using film and foil to cover or wrap food in the kitchen is an easy and budget-friendly way to prolong the life of food and preserve its flavor. But film and foil boxes are cheaply made and can have failing or dangerous cutters. With the stainless steel dispenser and cutter from Choice, you get one stable, durable unit that safely cuts both film and foil into smooth, even sheets. Available in 12", 18”, and 24” sizes, the Choice dispenser and cutter is made of stainless steel for long-lasting, back-of-the-house use. While the 12” and 18” sizes are perfect for most applications, the 24” model is sized just right for wrapping sheet pans. Plus, each dispenser comes with suction cup feet to maximize stability on the counter. And what about space-efficiency? Using the keyhole slots along the back of the unit, it easily mounts to the wall to save countertop space. To cut both film and foil, each dispenser and cutter features a sharp, serrated blade. When cutting film, we recommend using the included PVC slide cutter to prevent injury. This slide cutter features stopping points at both ends in order to prevent the blade from jamming and causing a delay or need for replacement. Plus the slider cutter is fast and easy to remove since it isn’t necessary when cutting foil. Before cutting, simply fill the unit with a box of either film or foil. The Choice dispenser accepts up to a 3000’ roll of film and up to a 1000’ roll of foil. Simply place the box into the dispenser, and carefully pull out the film or foil over the blade. If you’re using film, remember to use the slide cutter for optimal safety. Versatile, effective, and designed to last, this film and foil cutter is a no-brainer. So upgrade your cardboard boxes to a stable, durable stainless steel dispenser and cutter from Choice! 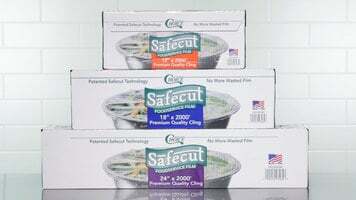 Promote safety in your bakery or restaurant kitchen with this Choice Safecut foodservice film! 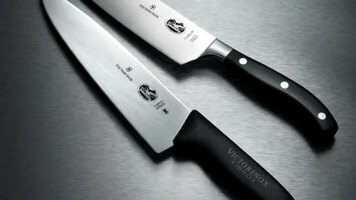 It features a covered blade, helping to eliminate accidental cuts and injuries. Plus, its film provides a quality cling around your items for superior freshness! 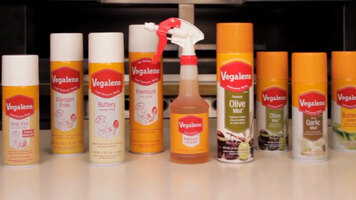 Save money and time by using Par-Way Tryson Vegalene seasoning sprays! With a variety of sprays to choose from, each spray adds irresistible flavors without the mess, trans-fat, cholesterol, or calories of butter and oil.